Part deux. Graciously gifted by the magnificent velo. 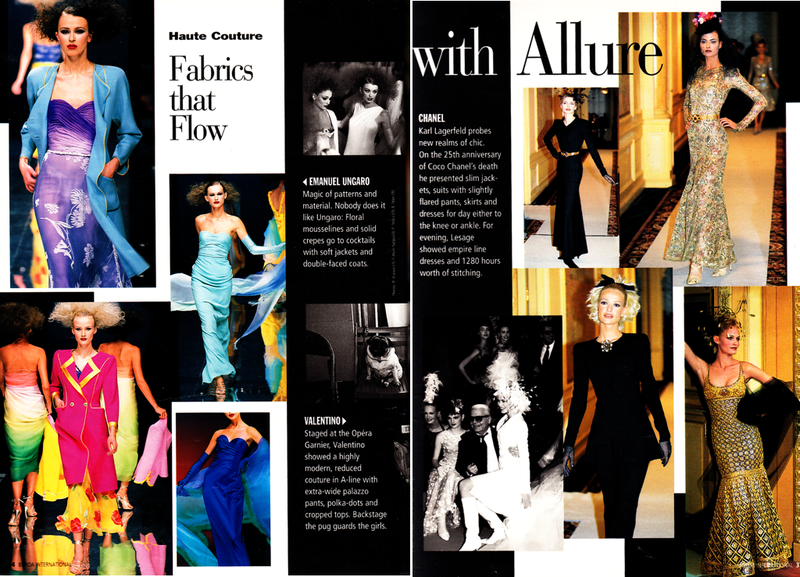 Back in the day when suits were unstructured and hair was poker straight..
Burda used to feature cat-walk shots and designer styles and inspiration from (then) current runway shows in an issue called Burda International. -100 for wilful mis-alignment of polka-dots down the centre front. 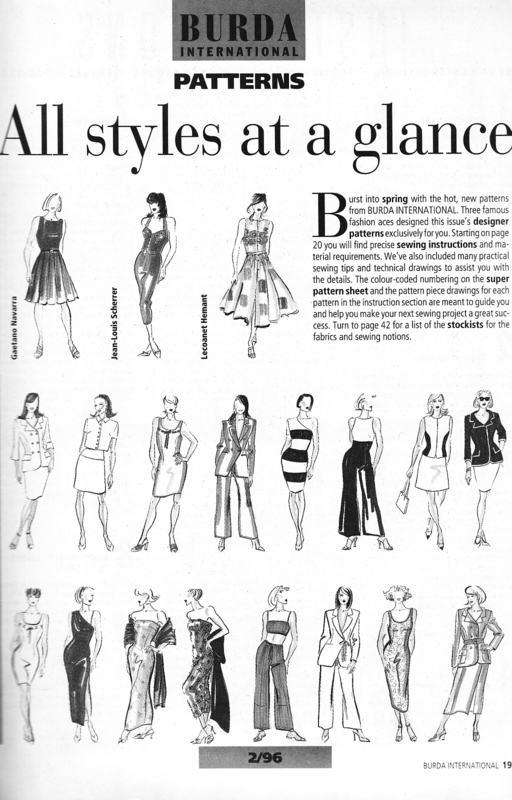 Pattern sets included at least one designer pattern (sometimes more) and sizes covered the gamut (from 34 up instead of 36 or 38 as is the norm today). 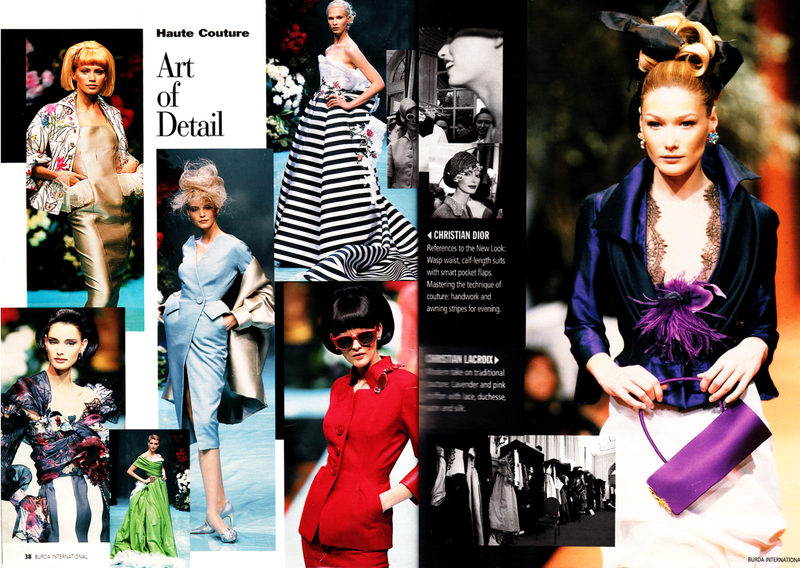 Burda international was a fashion magazine which just happened to include sewing patterns. And it was awesome. It had features on stylistic trends like the back-necklines version above. I particularly like the Mariot Chanet folded drape version. Celine have revived something similar this season by incorporating twists into their garments. Ah.. minimalism. That brown V-neck up top is one of my favourites in this issue. And check out the lump camouflaging ruching on the mint number next to it. Hunter green at bottom right looks like Vogue 2091. The cream of the crop though, has to be the Lacroix jacket on the right followed shortly thereafter by the red suit and the minimalist blue wrap by Dior. Yes, those were the good days. Patterns were depicted by fashion illustrations in the summary and line diagrams in the instructions section. The jumpsuit and the mod suit are pretty cool (row 2 #s 6 and 2) but my favourites are in the designer section. The perfect bustier and probably the only ‘waistcoat’ I can bring myself to sew.. (skirt with awesome pockets unfortunately not included). Simple little knit dress. Although I’d try it with equidistant inverted pleats first (rather than gathers) and sew it up with long sleeves in a merino jersey for winter. One can only hope…Oh well I’ll find out when it gets here-in three months time. Big ups to the blog mysummertouch for the advance preview link. Disclaimer: All images remain copyright of their respective owners and are used here for purposes of illustration, discussion and humour.